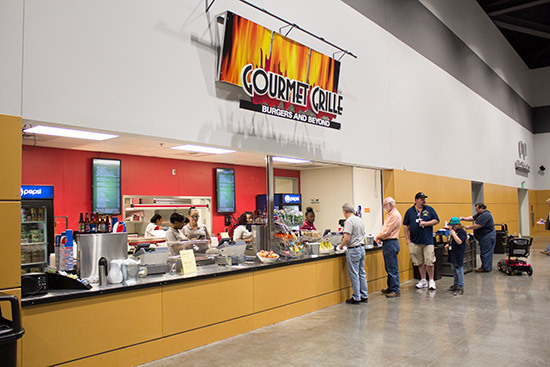 Location: Greater Tacoma Convention & Trade Center, 1500 Broadway, Tacoma, WA 98402, USA. 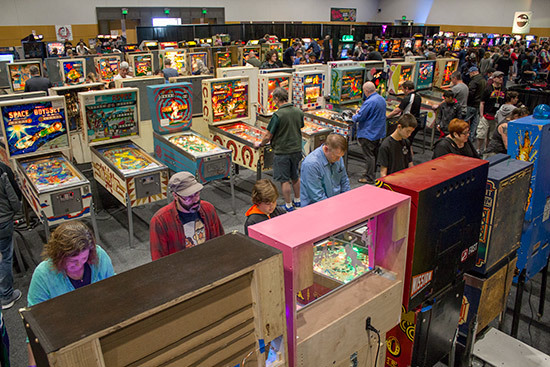 This year marks the tenth holding of the Northwest Pinball & Arcade Show. 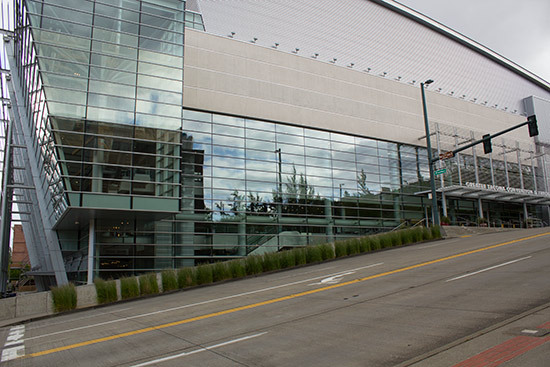 After starting in central Seattle, it is now held at the Greater Tacoma Convention & Trade Center in downtown Tacoma. The building sits on a hill, meaning there is a ground floor entrance at the front and a third floor entrance at the side. 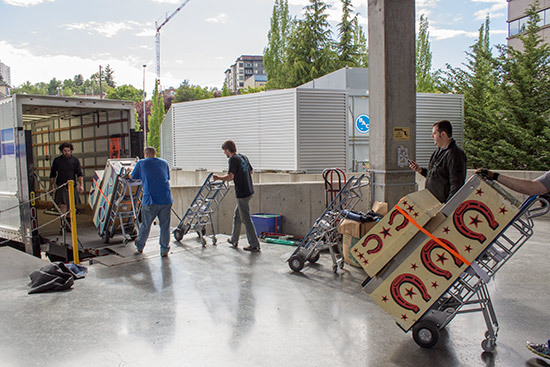 The show is held on the fifth floor which, thanks to the terrain, has a ground-level loading bay at the rear, from which an army of volunteers unloaded trucks as soon as they arrived. 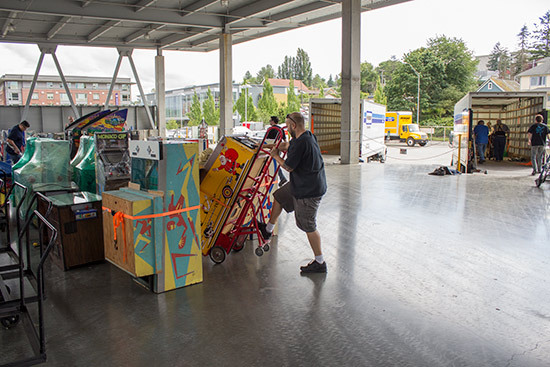 Games were initially unloaded onto the dock and then wheeled into the hall. 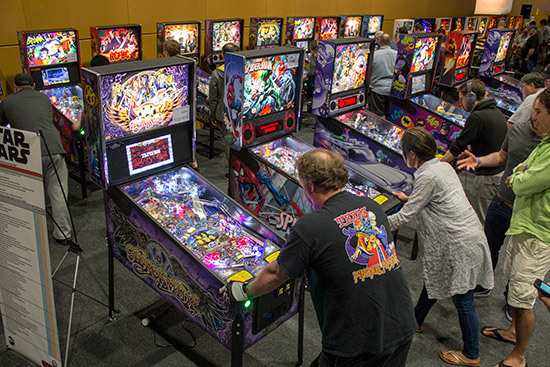 Stern Pinball has an impressive line-up of current titles, including Ghostbusters, Batman 66, Game of Thrones, AC/DC Remake and Aerosmith. 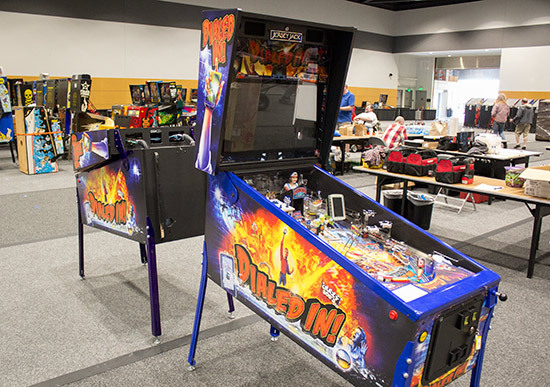 There are two Dialed In! 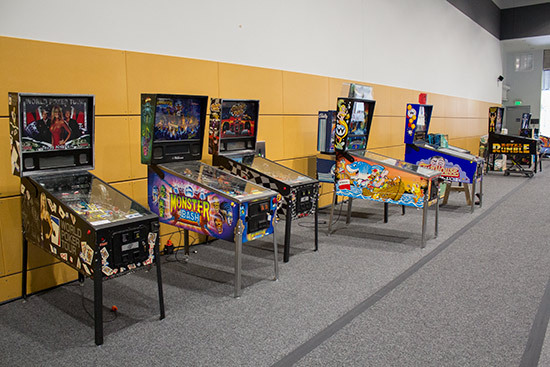 games set up in the centre of the hall. 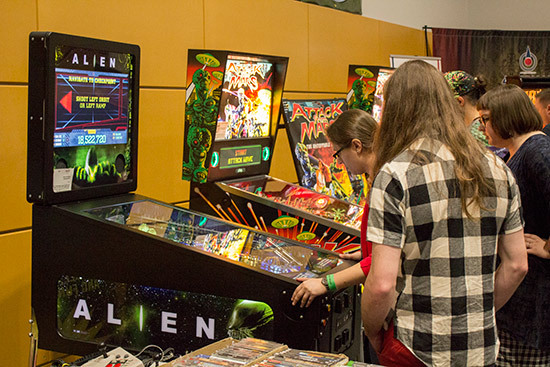 Nitro Amusements had an Alien Pinball and a Medieval Madness Remake set up, with a Houdini also on its way. 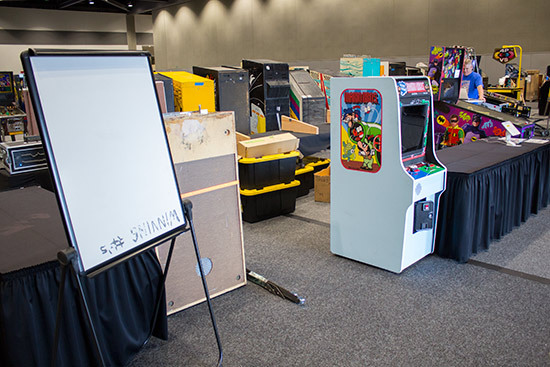 As usual, the tournament area is found on the left side of the hall. 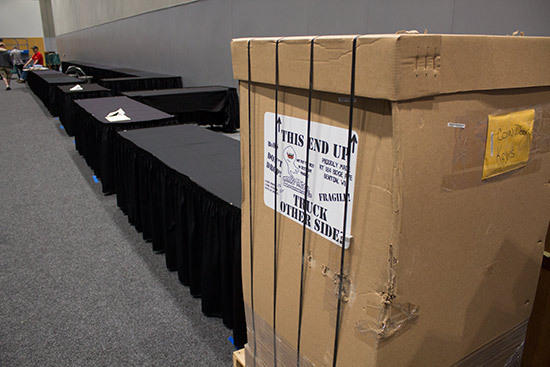 At the front of the hall, the prize desk was being constructed. 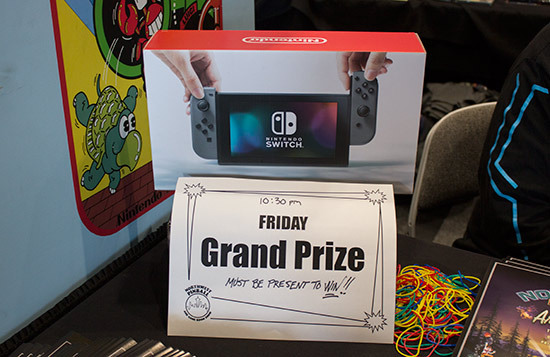 This is where the regular hourly prize draws will be held, along with the daily grand prize draws. 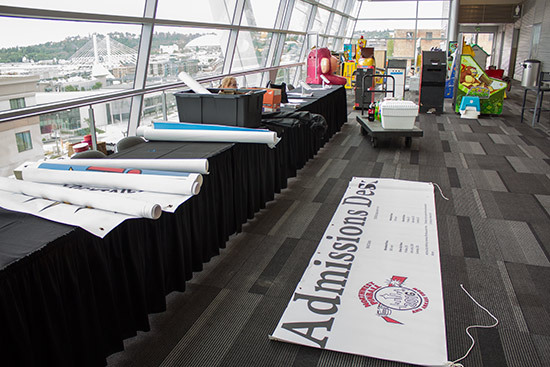 The show is held in exhibition hall B, but registration takes place in the lobby along with the seminars and a kids play area. 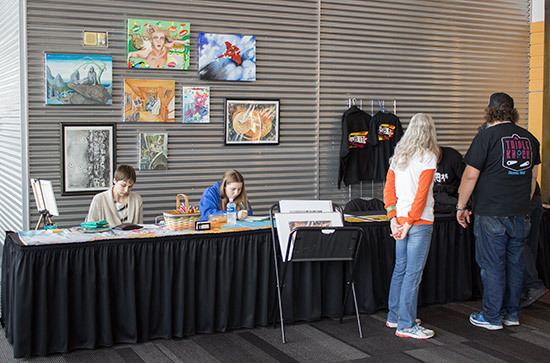 In the lobby just outside the show hall entrance were a few stands selling artwork, T-shirts and promoting comic books for kids. 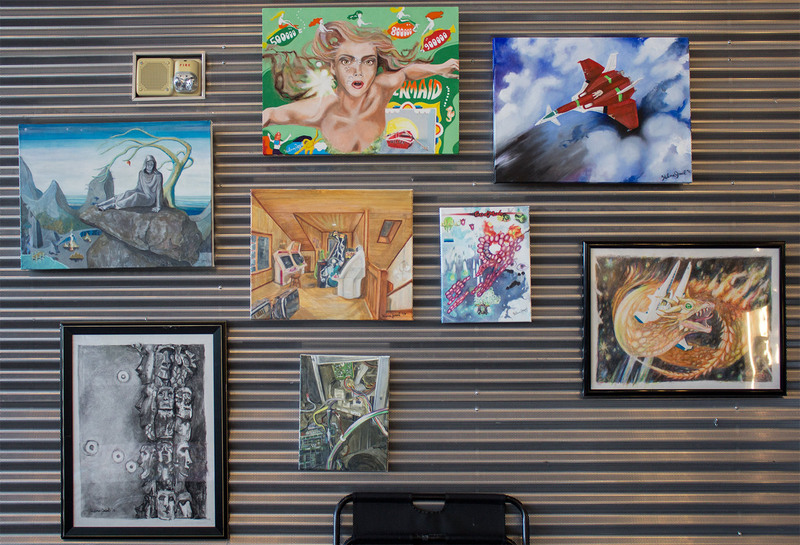 Artist Hilma Josal was exhibiting some of her artworks and there to talk about them and take private commissions. 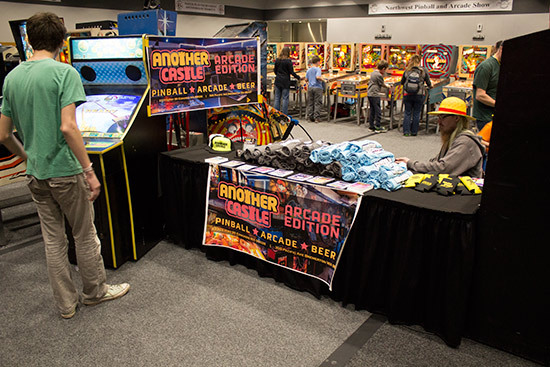 Next door, T-shirts promoting assorted pinball and arcade themes and locations could be purchased. 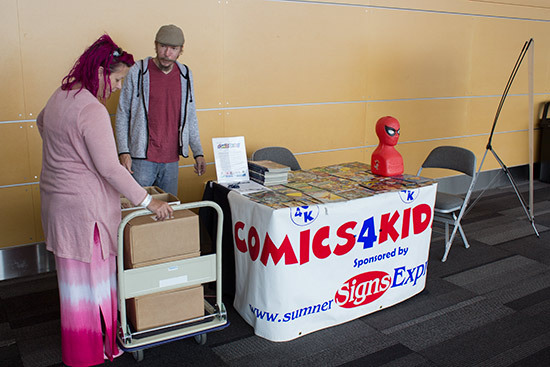 Also in the lobby, Comics4Kids were giving away comic books as a part of their drive to improve literacy and foster imagination in kids. 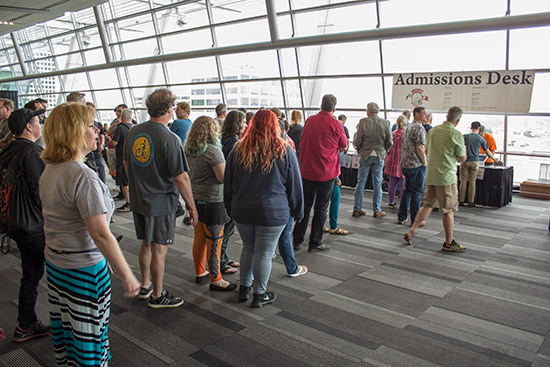 Before the opening, a large queue had built up to buy entry or to pick up pre-purchased tickets. 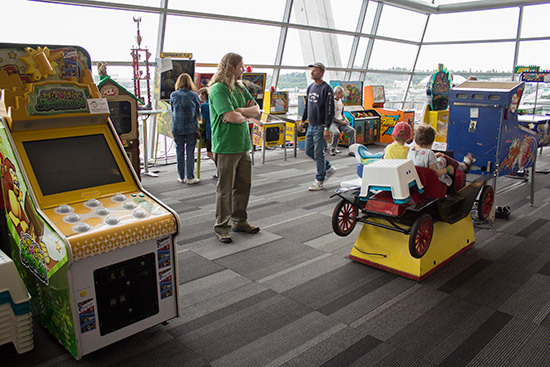 To keep the younger guests entertained while they waited for the start of the show, there was the kids area with games on free play. 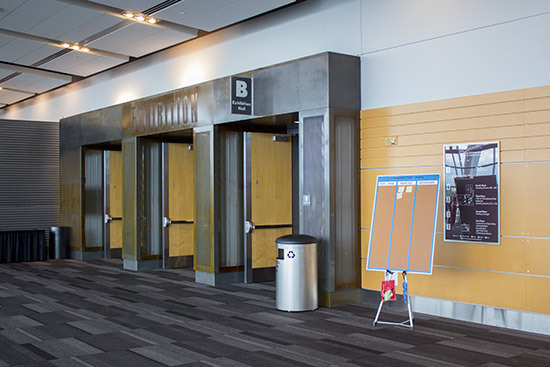 The doors to the hall opened on schedule at midday. Inside the hall there had been some changes since Thursday night. 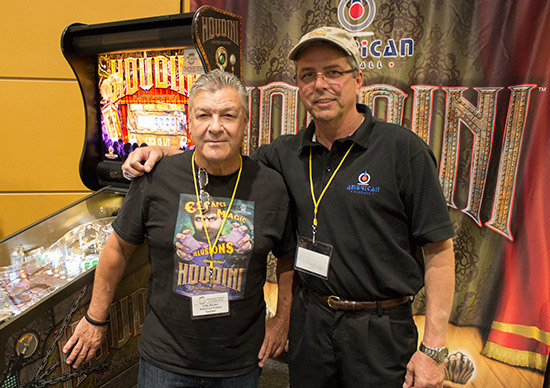 The Houdini game had arrived, along with Jolly Backer and Joe Balcer from American Pinball. 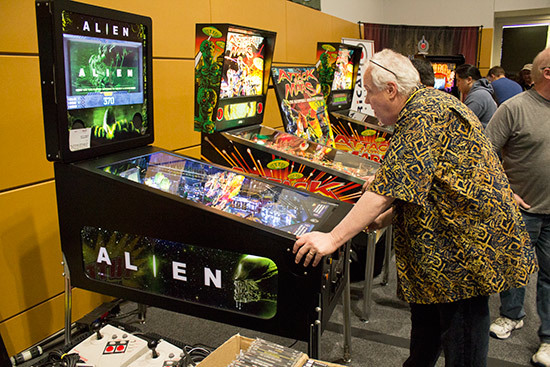 Also on the same stand, Heighway Pinball’s Alien Pinball was being checked out by the game’s sound designer and composer, David Thiel. 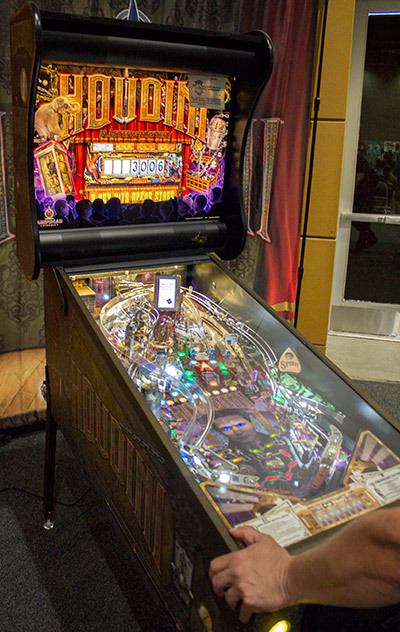 Jersey Jack Pinball had their The Wizard of Oz and The Hobbit games, in addition to the two Dialed In! 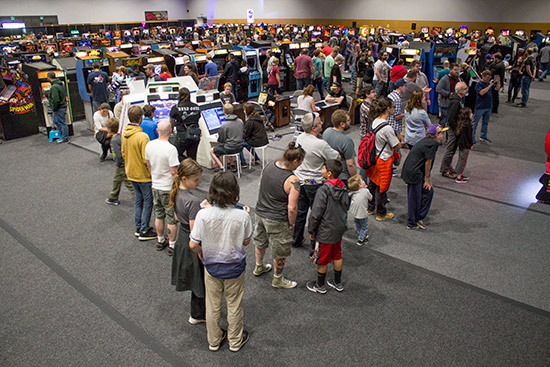 games in the centre of the room. 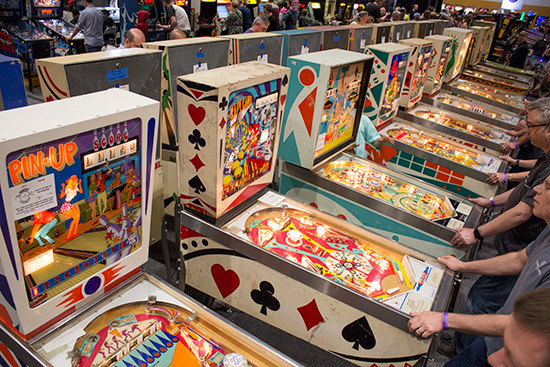 The number of Stern Pinball games brought by Marco Specialties had also increased, with the display expanding to two rows. 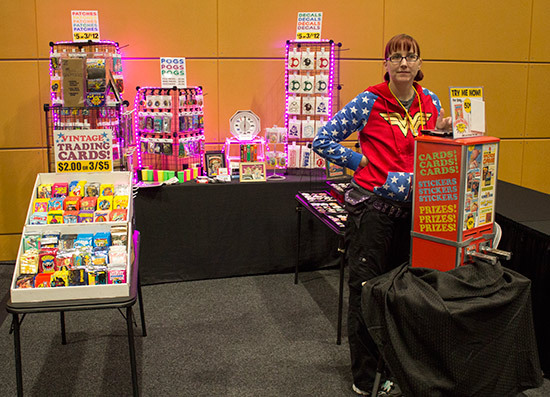 The prize desk at the front of the show was complete, exhibiting the many prizes on offer and the complete machines which would be given away to lucky ticket-holders. 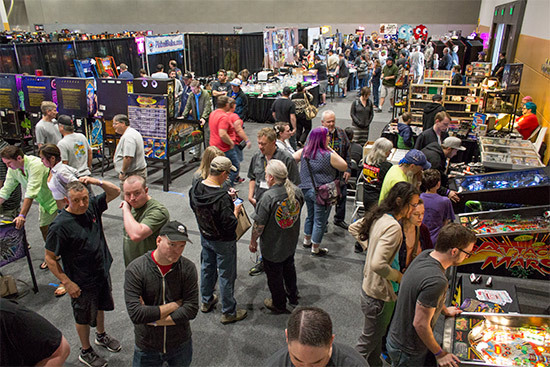 If you didn’t think you were lucky enough to win, you could always make a silent bid on a new Ghostbusters playfield, or just buy some of the show merchandise. 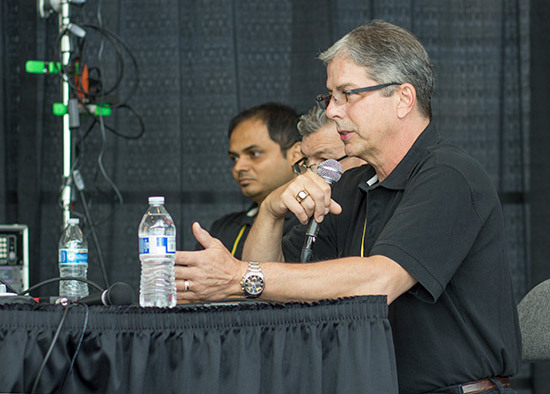 The first seminars of the show also took place on Friday. 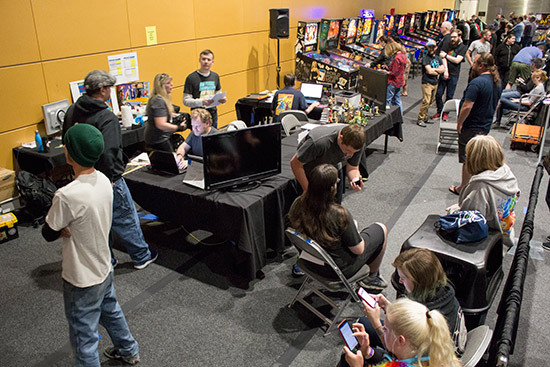 All the seminars were intended to be streamed live and also made available on YouTube after the show, Due to technical difficulties, they weren’t all streamed, but should all be available on the Northwest Pinball & Arcade Show’s YouTube channel. 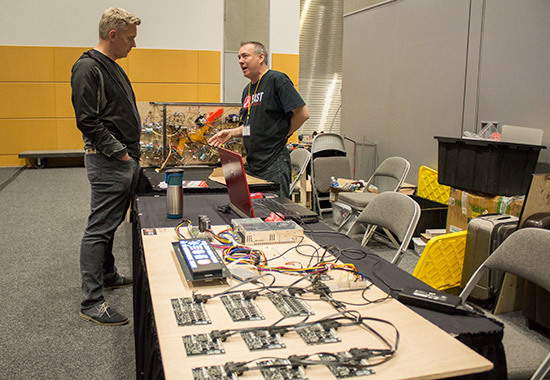 As is usual at the show, the seminars are kicked-off by Dave Okert and David Shoemaker who this time held three technical seminars – NVRAM For Pins & Vids, Scan Line Generator For LCDs and Wizard Of Oz Pinball Troubleshooting & Repairs. 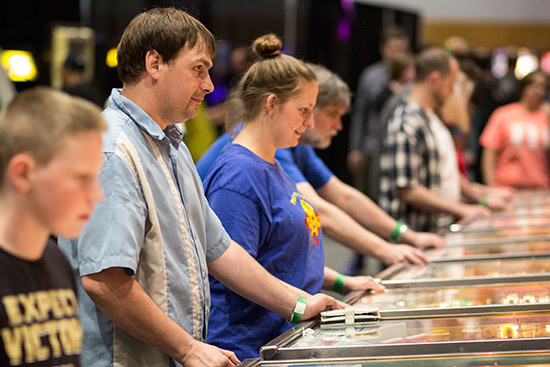 Then at 5pm Stern Pinball game designer John Trudeau held a seminar to talk about his Ghostbusters game. 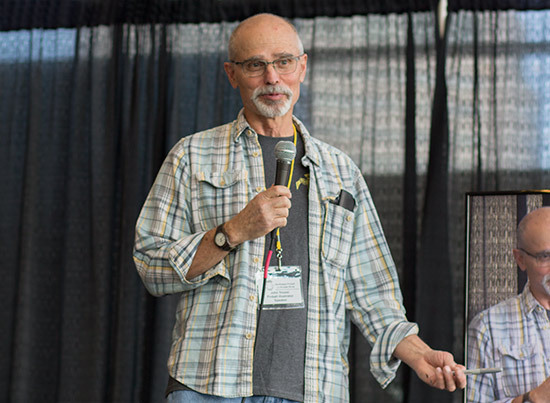 He was joined by Stern’s Art Director, Greg Freres who described how the game’s artist, Jeremy Packer a.k.a. 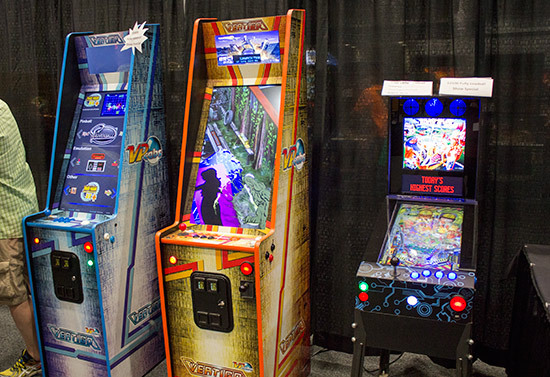 ZombieYeti, created the cabinet, playfield and backglass art packages for the three models. John began by talking about his design ideas, things he really wanted to get into the game, the things which were taken out, and the various elements from the first and second movie incorporated into the game. 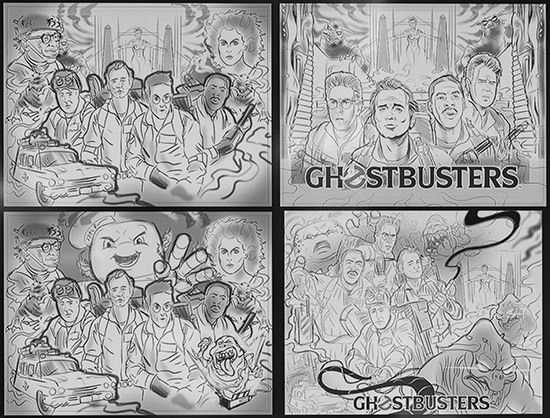 Greg then showed some initial sketch ideas for the backglass, all of which features a montage of the four Ghostbusters, but arranged in different post ions and poses. He also said how Bill Murray was not happy with the idea of a hand-drawn depiction, but was eventually brought around to the idea and Jeremy’s stylised treatment. 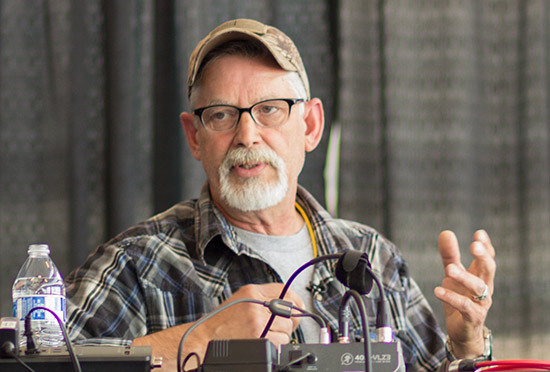 After John and Greg it was time for a seminar by Tim Kitzrow. 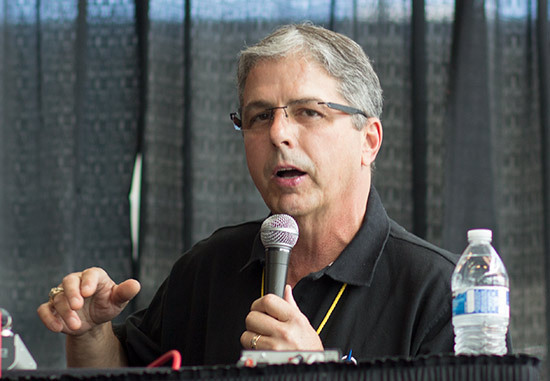 Tim is a voice artist who has provided the commentary track for many sporting event along with arcade and console games. 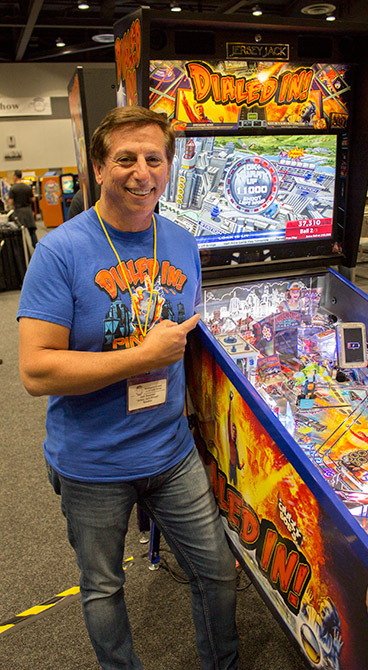 His pinball credits include NBA Fastbreak, World Cup Soccer, Judge Dredd, Roadshow, Twilight Zone, Attack from Mars and The Shadow. 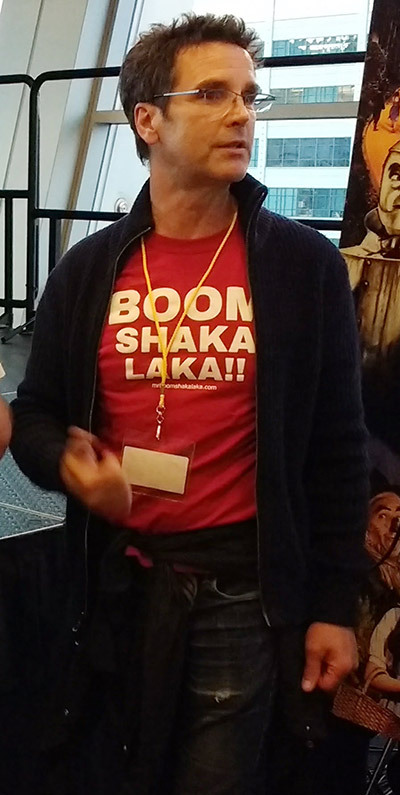 His catchphrase is “Boom Shaka-Laka”, which he was promoting with special T-shirts and on his MrBoomShakaLaka.com website. 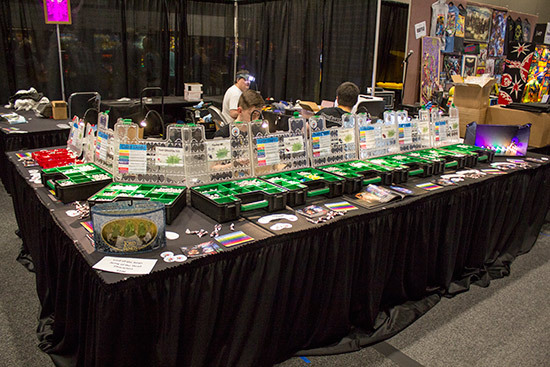 As anticipated, Saturday is the busiest day at the show. 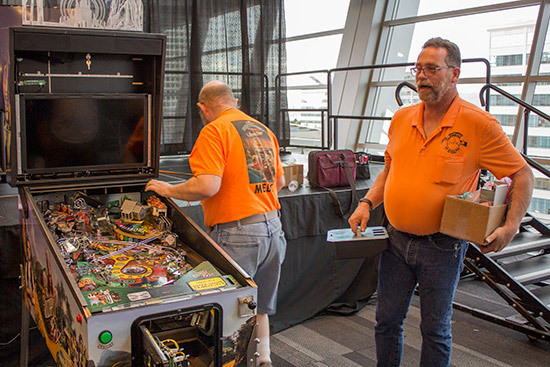 That meant most of the 192 free play pinball machines along with many of the video games were in use for most of the day, while the team of medics were fully occupied making repairs and sorting out stuck balls. 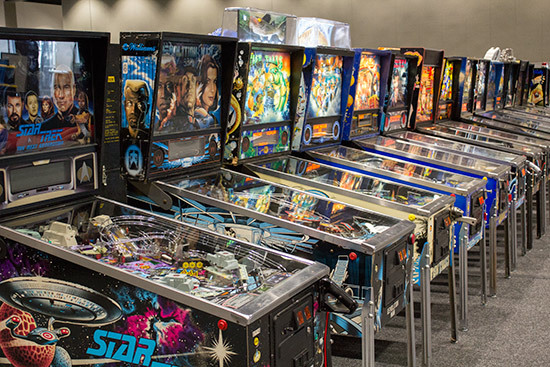 Here’s a full list of the pinballs available to play at the show. 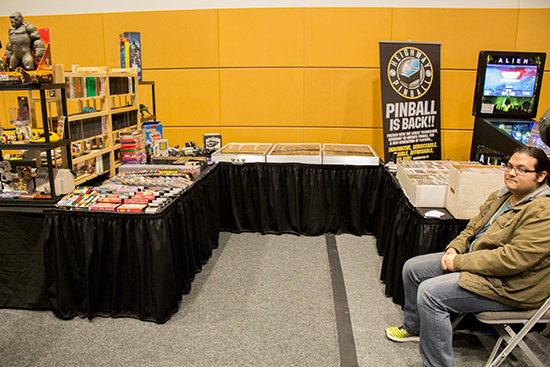 Saturday’s seminars began at 11am with the team from American Pinball, led by Joe Balcer. 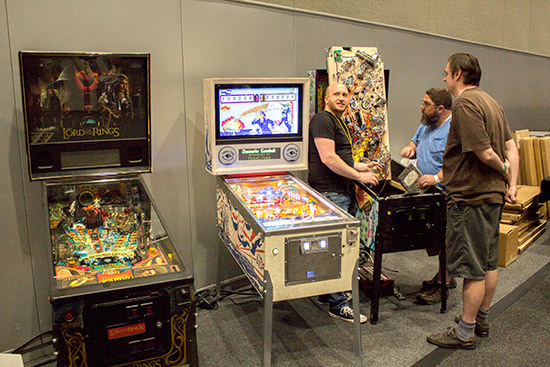 The team was here to talk about their Houdini game which was on the show floor at the Nitro Amusements stand. 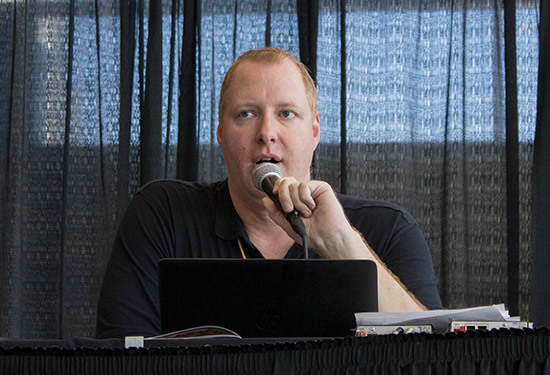 Joe did most of the talking, describing the history of the game, how it totally changed from the original concept, and how they rejected the pre-order sales model in favour of building the game first and then offering it for sale. 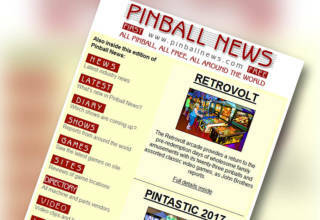 He said they will build the game at the American Pinball factory in Streamwood, Illinois, with playfields coming from an external company. 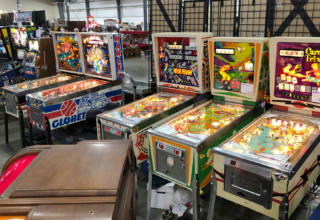 There are, he continued, a number of options available for playfield suppliers both in the US and in Europe. 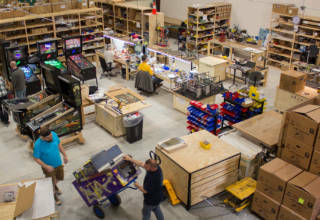 Similarly, some of the game assemblies will be built and tested externally, although the two largest mechanisms will be built in-house. 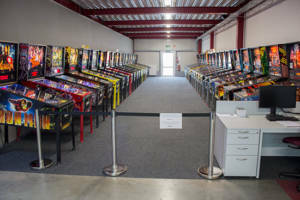 Joe said they were planning for an initial production run of 1,000 machines, with the intention of ultimately getting production up to 100 machines a week. 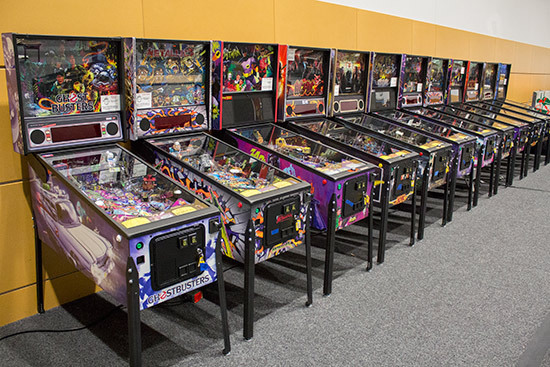 Jolly then talked about setting up the distribution network, saying they had no intention of selling machines direct to customers, along with all the pre- and after-sales support that results. 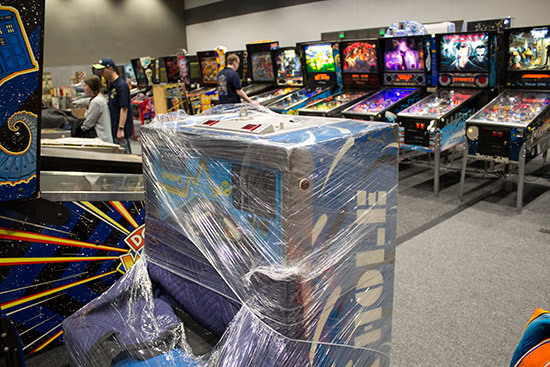 Jolly also said that the 1,000 machine number quoted by Joe was only for North American sales. 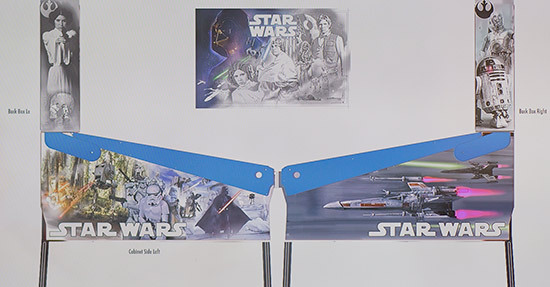 The company already had 12-15 distributors in the US and Canada but hadn’t yet appointed any European or Australasian distributors. 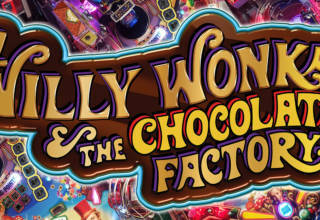 However, Jolly expected an additional 1,000 machine sales from those areas. 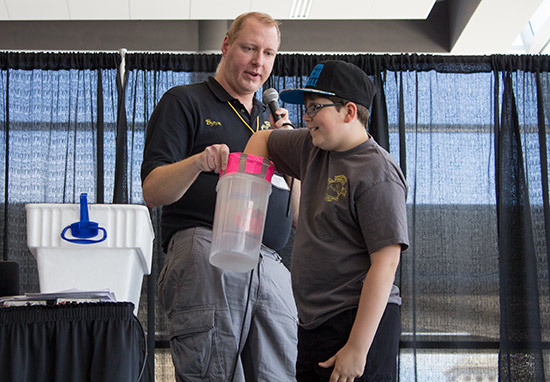 At 12:30, John Youssi took to the seminar stage. 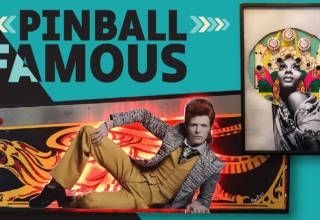 John is a renowned artist with many pinball game credits. 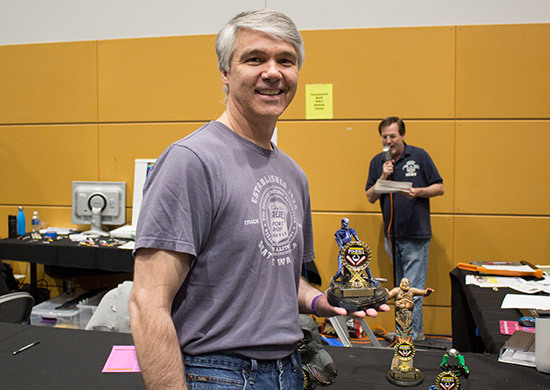 He is especially well-know for his many collaborations with game designer Pat Lawlor, having created the artwork for all Pat’s games since Whirlwind in 1990. 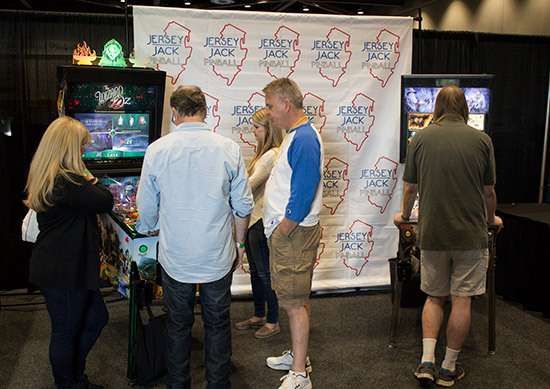 John talked specifically about their latest collaboration – the Jersey Jack Pinball game, Dialed In!. 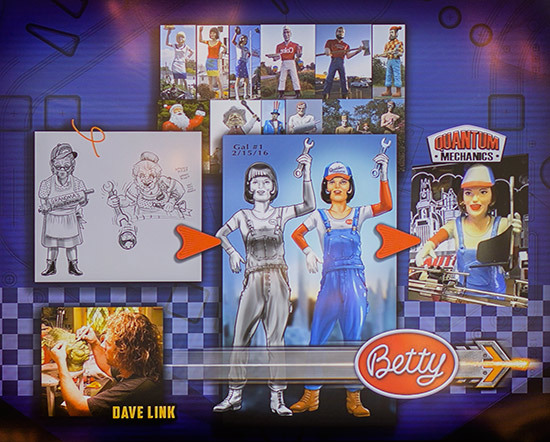 He explained how the final artwork evolved from a series of pencil sketches – many of which were not ultimately used in the game – through to black and white artwork and then to full colour, often changing along the way to better match the physical playfield toys. 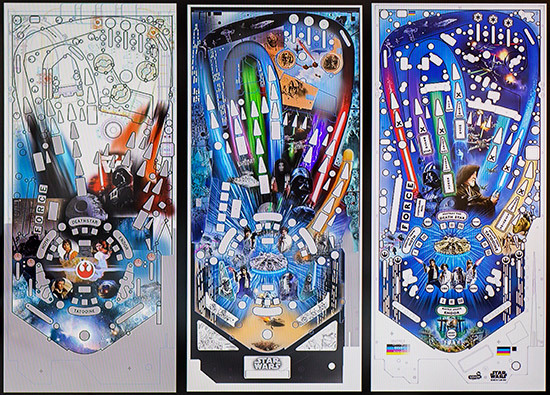 He also showed the different versions of cabinet, backbox, bottom arch and backglass art used in the Collector, Limited Edition and Standard Edition of the game. 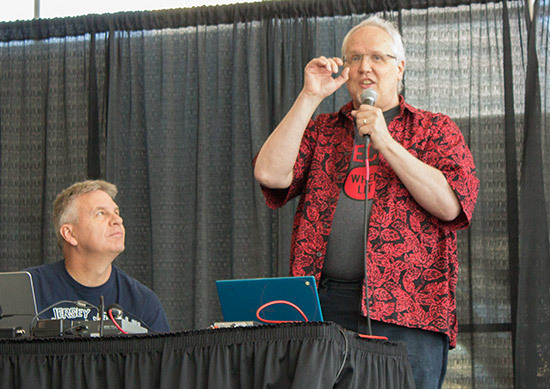 John also revealed how he was responsible for the exclamation mark at the end of the Dialed In! title. He put it in and, he said, nobody asked him to remove it. 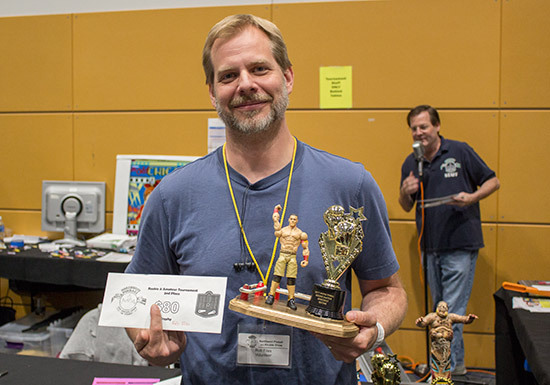 After his seminar John talked to guests and signed translites, flyers and other items he designed. 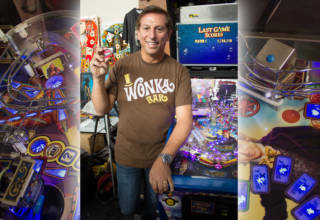 Then, continuing the theme of Dialed In!, Jack Guarnieri a.k.a. 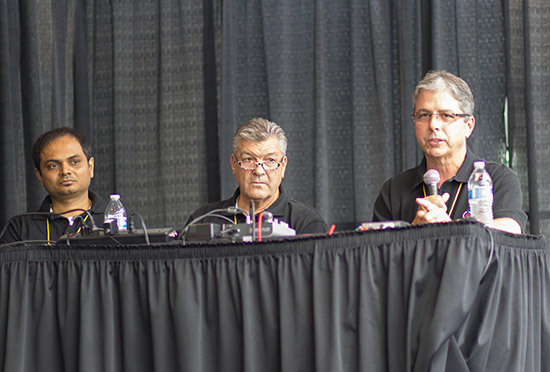 Jersey Jack was joined on stage by Butch Peel and David Thiel to talk about the conception and subsequent development of the game. 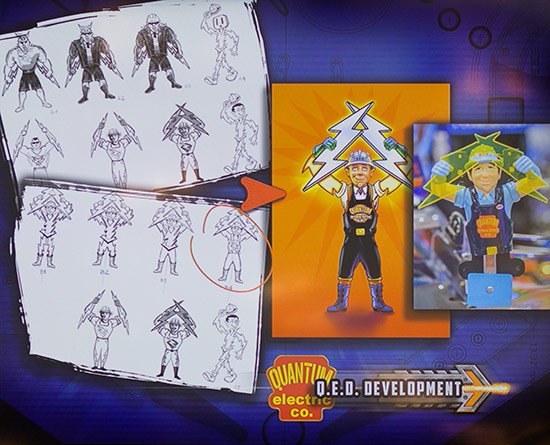 Jack talked about how he first got Pat Lawlor to design a game for his company, and how he was sold on the original concept of a disaster-themed game, following on from Pat’s earlier Whirlwind and Earthshaker! titles. He showed pictures from the factory showing the first production Dialed In! games on the line. After a long day at the show, we took the opportunity to dive out for some lunch at a wonderful Japanese restaurant just up the street in Tacoma called The Koi. Their happy hour began at 2pm when all shareable dishes are just $5, beers $2.50 and they have a couple of specials on sake. We especially recommend their Panko Oyster, Yummi Mini and Fancy Jalapeño. The 7 Seas Seven Ballz Deep IPA is also very tasty. They were so good this was our second consecutive lunchtime visit, having vowed to return after the first visit. 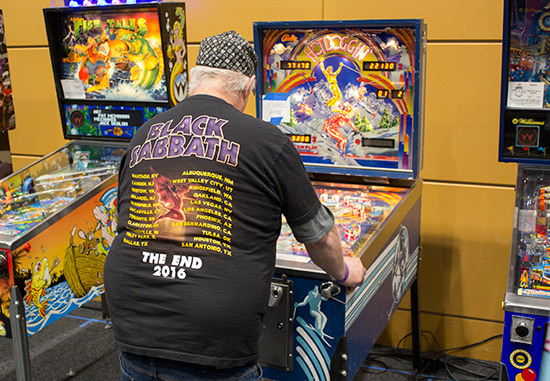 When we returned at 3.30pm, refreshed and relaxed, Mark Ritchie was just taking to the stage to talk about his life in pinball. 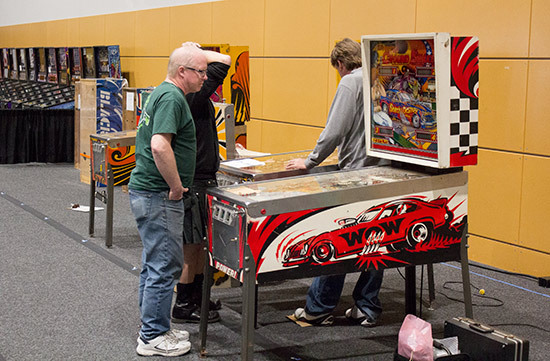 Mark described how he got into the pinball business, first at Atari and then at Williams, initially as a technician and then as a game designer starting with Thunderball which was never manufactured beyond the ten prototype games. 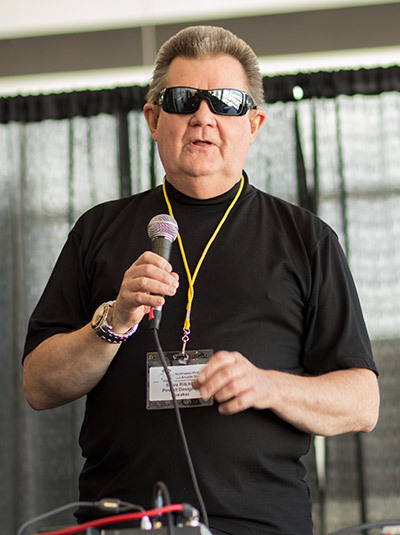 After that, he did Firepower II – the sequel to his brother’s game – and Pennant Fever, a pitch-and-bat baseball game which was, he said, Williams’ first solid-state pitch-and-bat game. 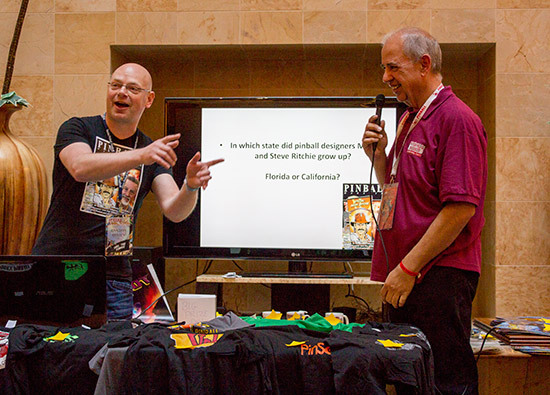 Mark then talked through all his games in chronological order, including such classics as Big Guns – one of his collaborations with Python Anghelo – Taxi, Diner, Fish Tales and Indiana Jones. 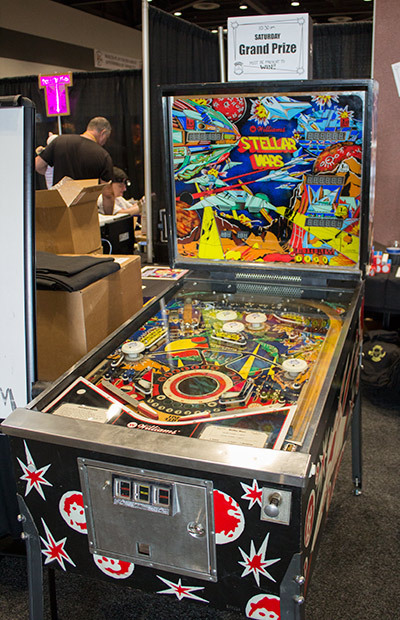 Mark certainly didn’t rule out a return to pinball, but did confide to us that rumours of his involvement in a Pulp Fiction game being built by Stern were just that – rumours, with no truth behind them. 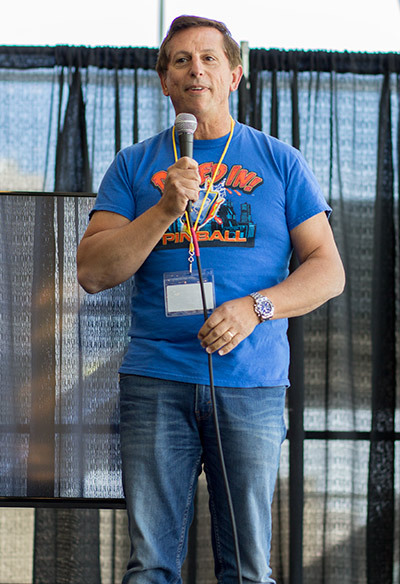 Mark’s brother Steve Ritchie was next to take to the stage with his 5pm seminar. 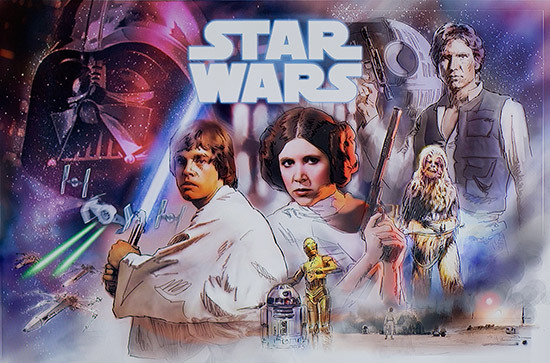 After showing a promo video from Star Wars Steve described the gameplay, saying at the start of the game you can choose one of four characters – Luke, Leia, Han or R2-D2. He said they had a lot of fun despite all the grief from the licensor, although they didn’t interfere with the design of the playfield. 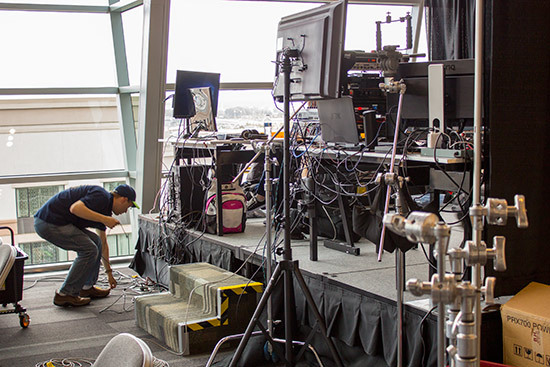 Meanwhile back in the show hall, here’s a look around the show using our aerial camera. 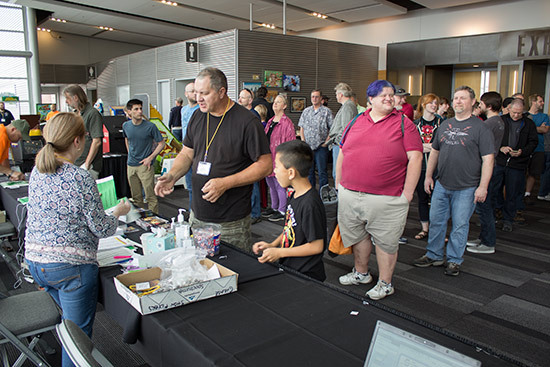 No show would be complete without its selection of vendors and the NWPAS didn’t disappoint here either. 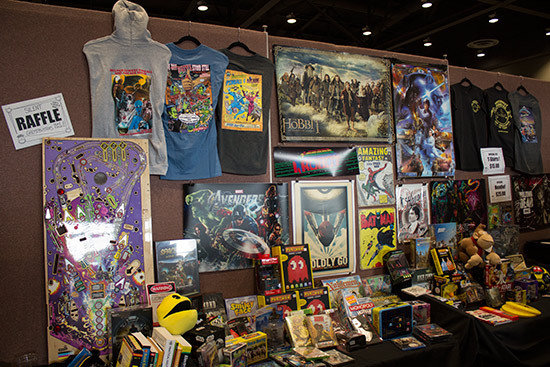 Here’s our exclusive Twenty-Five Minute Tour video walk-around at the NWPAS 2017, showing you everything from the lobby, through the main hall and into the seminars. 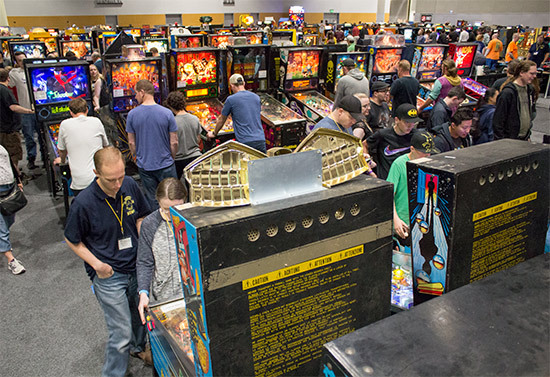 As usual, several pinball tournaments were held at the Northwest Pinball & Arcade Show, with the largest being the Match Play tournament, entry to which cost $25. 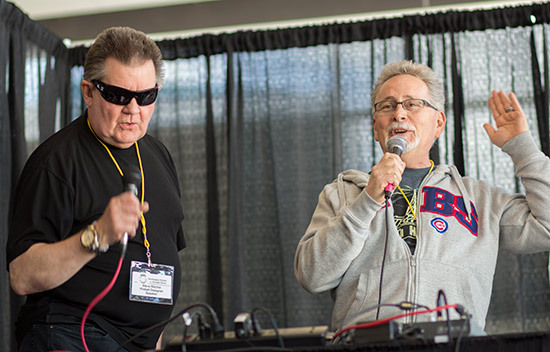 The tournaments were run by Dave Stewart and Germain Mariolle. 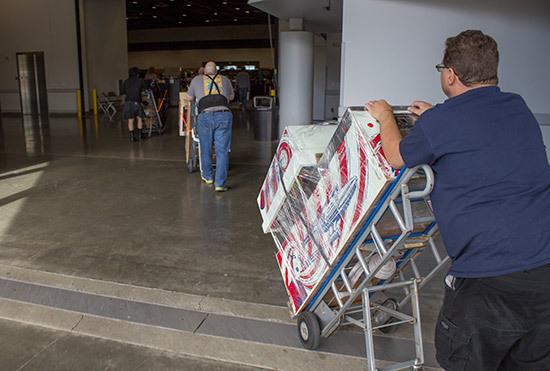 This had five three-hour qualifying sessions, starting at 1:30pm on Friday with the final session at 8pm on Saturday evening. 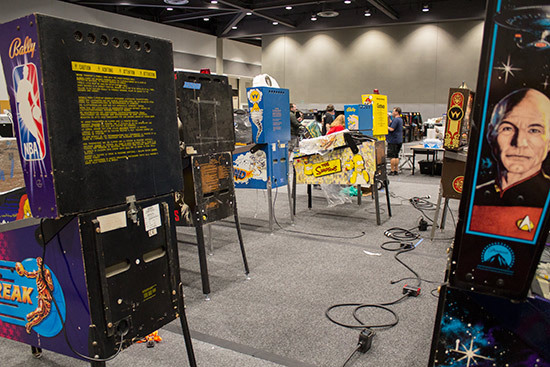 Each session saw players put into 3- or 4-player groups to play a single game on a specified machine. 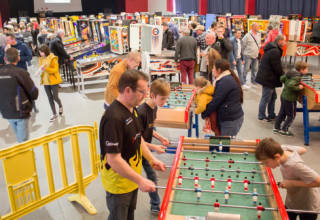 Points were then awarded for positions, with bonus points awarded according to how large the gap was between players’ scores. 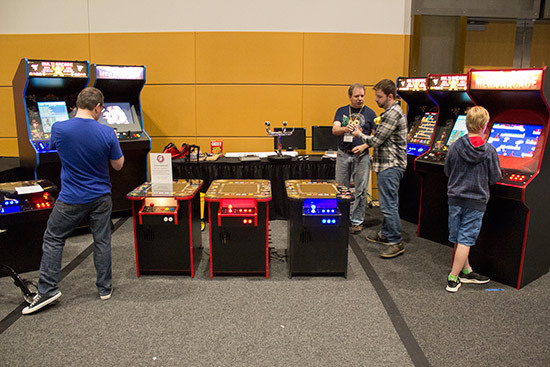 After the first game, new groups were made and a second machine played in the same way as the first. 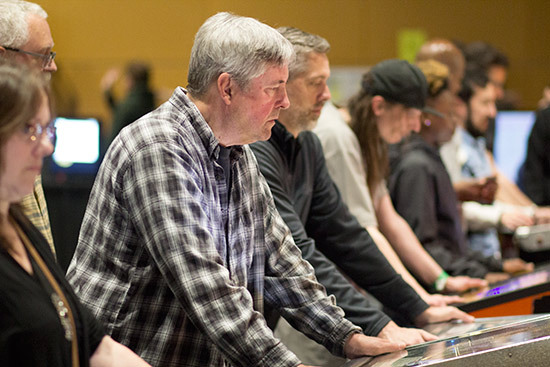 This continued until five machines had been played, when the seven players with the most points had qualified. 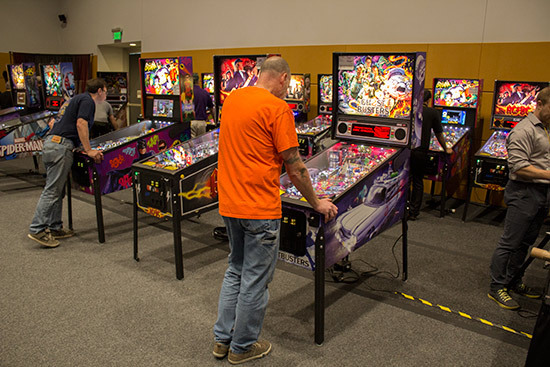 The top qualifier received a bye through the next round, while the remaining six played in the first round of play-offs on Sunday morning. 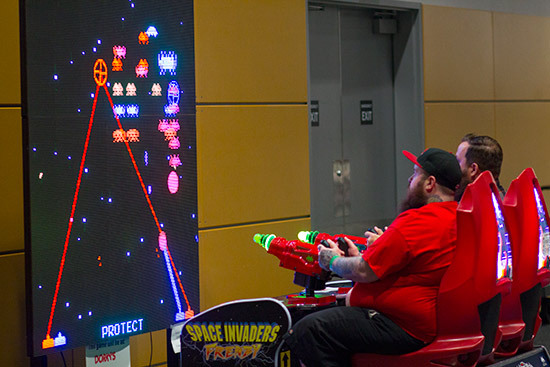 Those who didn’t qualify could try again in up to two more sessions. 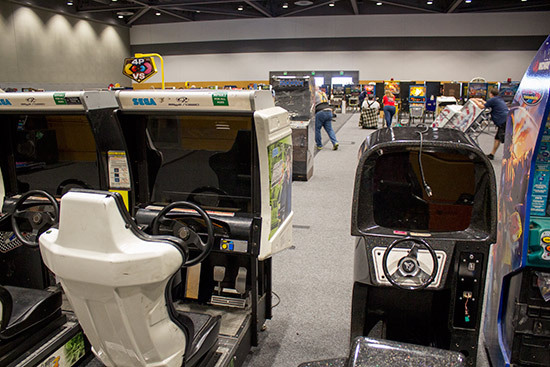 Meanwhile, the Pingolf Tournament was played on ten machines on the other side of the tournament area. 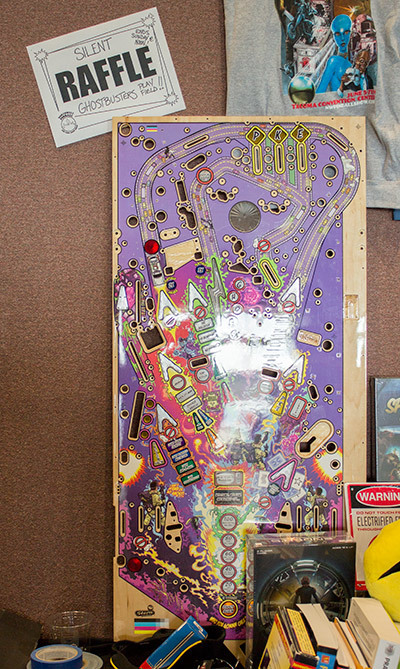 Entry to this was also $25, which got you one game on each of the ten machines. 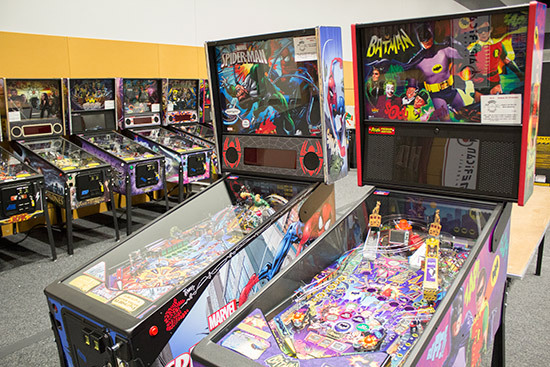 Each machine had a score target to achieve using the fewest balls possible. 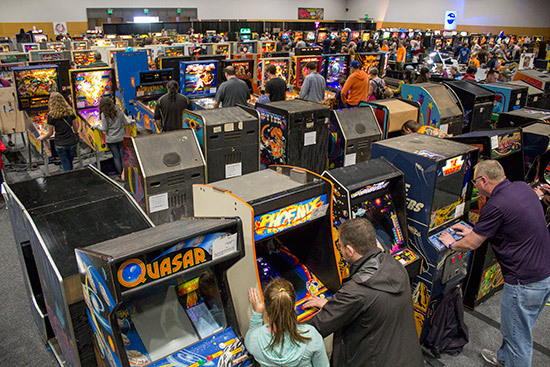 All the machines were set to five ball play, and the number of balls used to reach the target was your score for that machine. 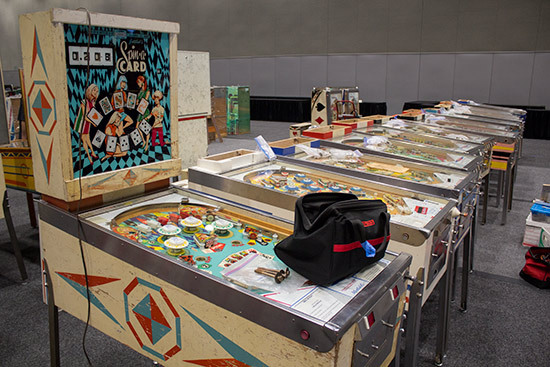 If the target wasn’t reached with the five balls, a sliding scale gave you a score from six to ten, depending on how close you got. The 27 players with the lowest scores qualified for the play-off round which took place at 5pm on Saturday. 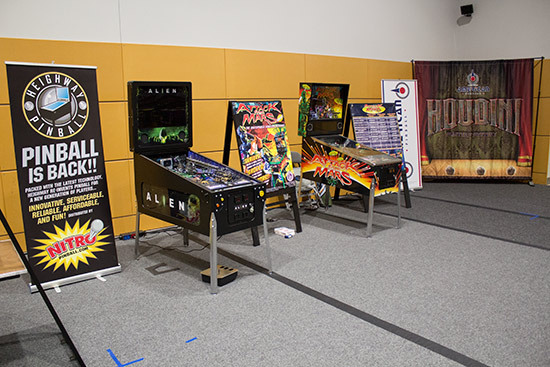 In addition to these two, there was also a Rookie Tournament for players with an IFPA ranking of 2,000th or lower, or if they are unranked, a Women’s Championship where the top prize was a restored Ali pinball supplied by sponsors Nitro Amusements, and a Kids Tournament held on Shrek out in the lobby. 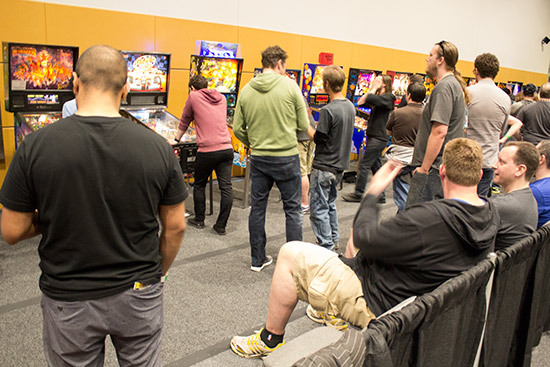 The main Match Play Tournament was the last to finish and came down to a three-way final between Eden Stamm, Jesse Mullene and Jesse Labbe. 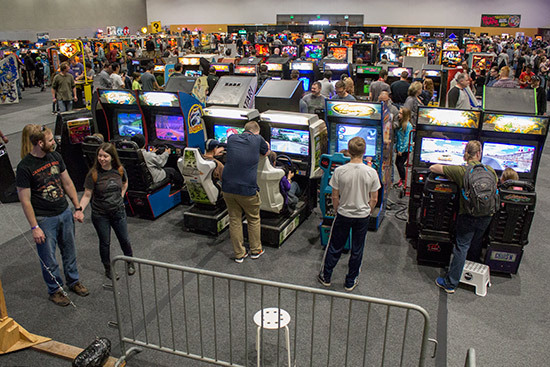 Time is always very tight for the tournaments at the NWPAS, with the show closing at 3pm and no tournaments allowed to continue past that time. 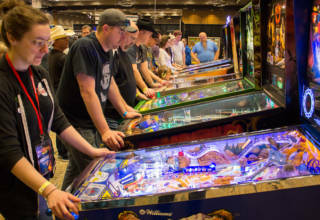 As a consequence, the final of the Match Play Tournament is played as three concurrent three-player games with players moving from machine to machine as their turn comes up. 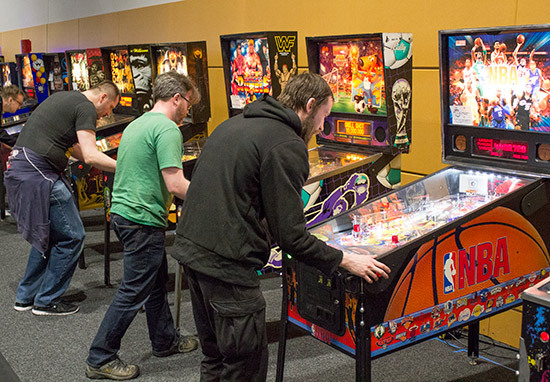 The three machines chosen were WWF Royal Rumble, World Cup Soccer and NBA. 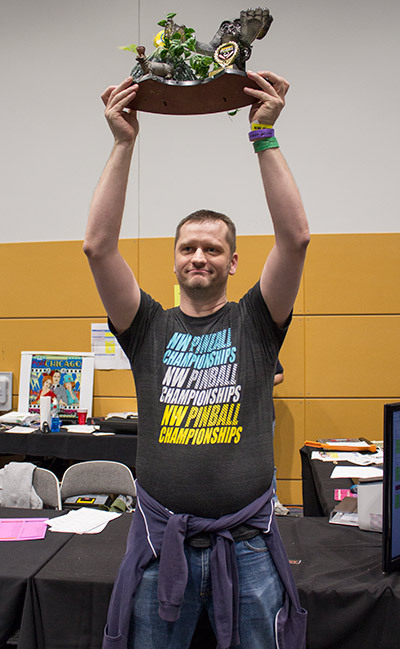 After winning on World Cup Soccer by 728,720,800 to 674,773,190 and 350,062,980, and also on NBA by 14,485,210 to 5,456,350 and 1,219,210, Eden looked unassailable with only WWF Royal Rumble to complete. 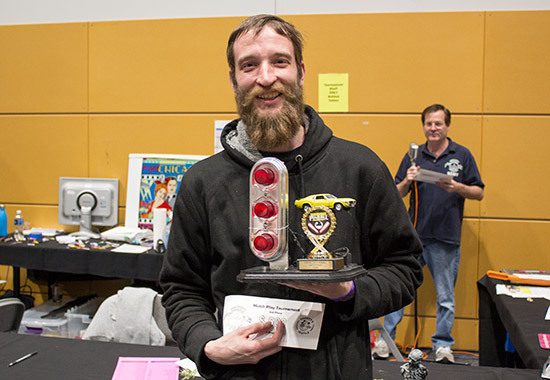 The shot shown above gave him the win on WWF as well, with Jesse Mullene in second place and Jesse Labbe in third. 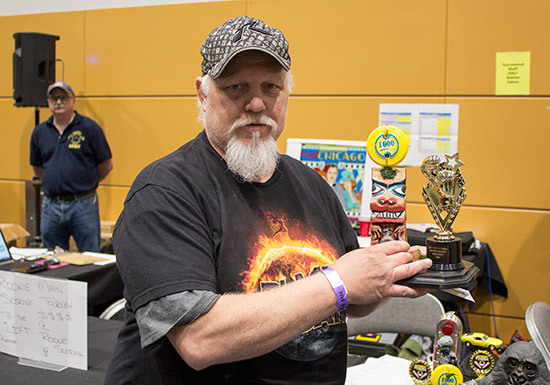 Prizes and cash awards of $1,000 for first, $700 for second and $500 for third were presented by Tournament Director, Dave Stewart. 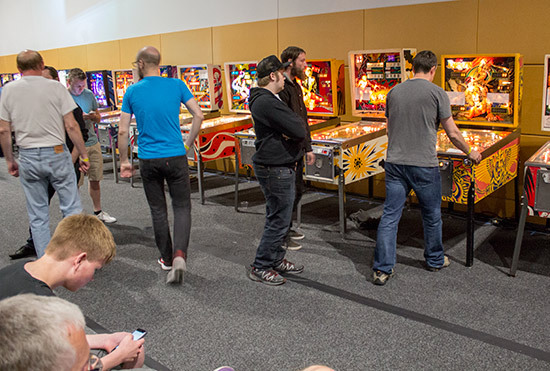 There was also a B Division in the Match Play Tournament for the quarter-finalists who finished in 8th-21st places. 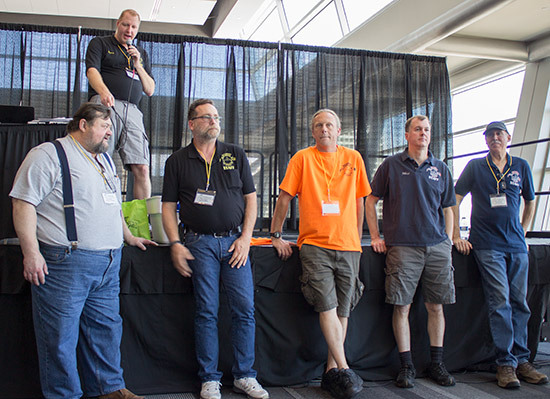 These B Division players played alongside the A Division players shown above, with their final taking place on The Walking Dead, The Lord of the Rings and Congo. 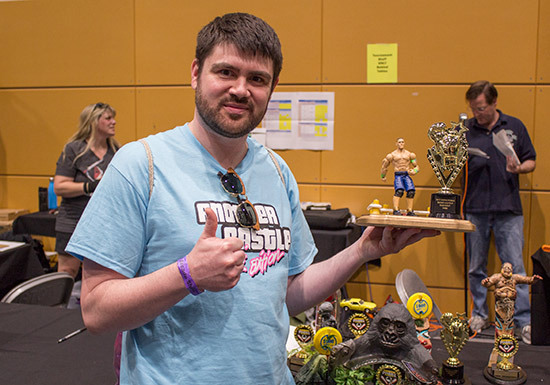 Josh Bartlett won on the first two and came second on Congo to win the final. Dwayne Smith was second on the first two and third on Congo to tie on points with Nic Crowson who was third on the first two but won on the third, but Nic won the play-off to take second. 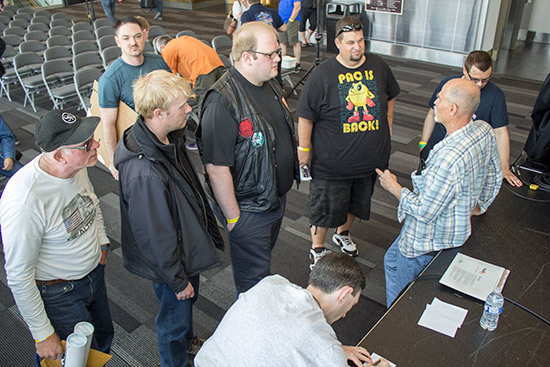 The Rookie Tournament was played in a three-strikes-and-you’re-out format, with head-to-head matches between the 97 players who entered. 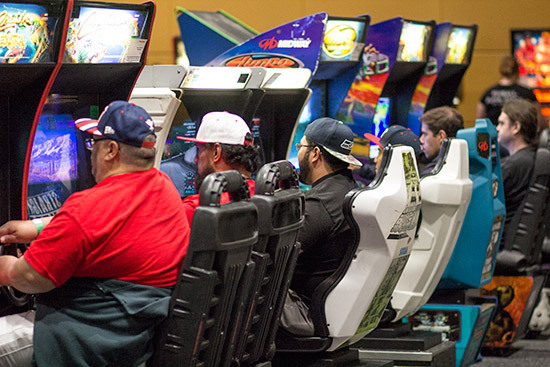 This meant players continued playing in rounds of single two-player games until they had lost three games at which point they were out of the tournament. 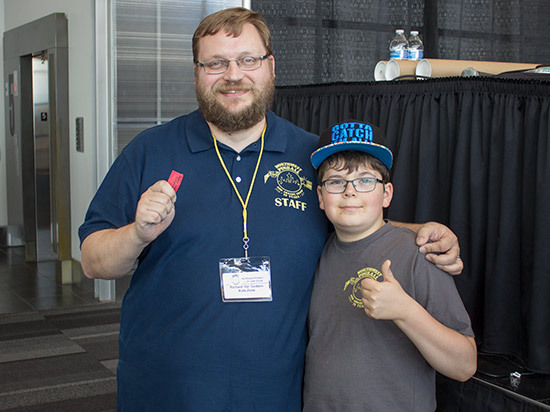 Time constraints meant the tournament had to be drawn to a close with a bunch of players still on two strikes, two on one strike and one player undefeated. 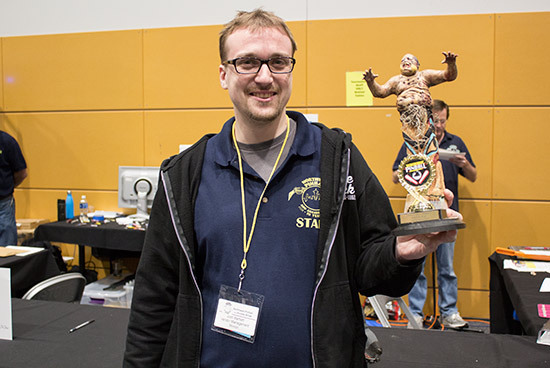 The twelve players on two strikes were all given $20 prizes for joint fourth place, while Thomas Stepp who had no strikes yet played in a three-man final with Vincent Sperrazza and Rob Files who both had one strike. 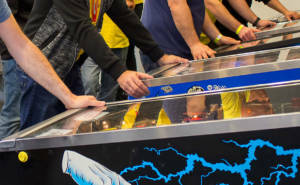 The format for the sudden-death final on Hot Doggin’ gave just one ball to Rob and Vincent, with Thomas having two balls to play due to him having one fewer strike against him. As it transpired, after one ball each Thomas was already in the lead and so didn’t need to play his second ball. Rob was second and Vincent third. 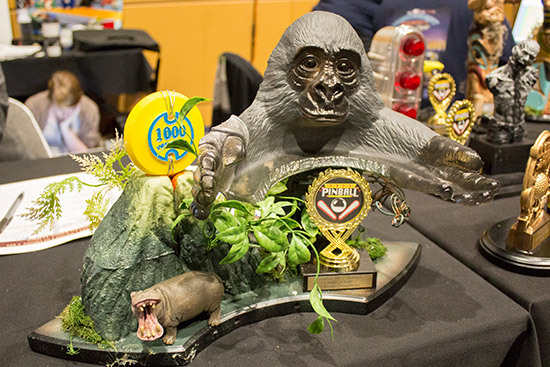 The final rounds of both the Women’s Tournament and the Pingolf Tournament were held on Saturday night when a prior dinner engagement prevented us being in attendance. 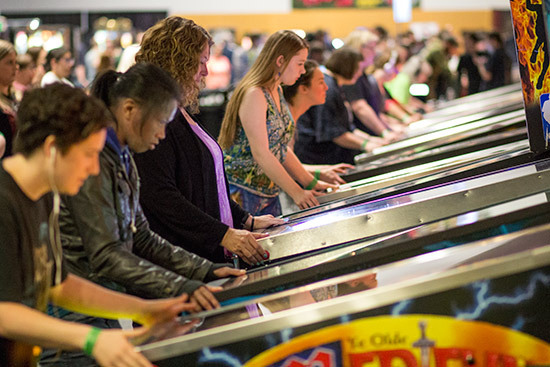 However, the final of the Women’s Tournament was a series of four games played by the four finalists who were Julie Gray, Alexa Philbeck, Sara Urban and Maureen Hendrix. 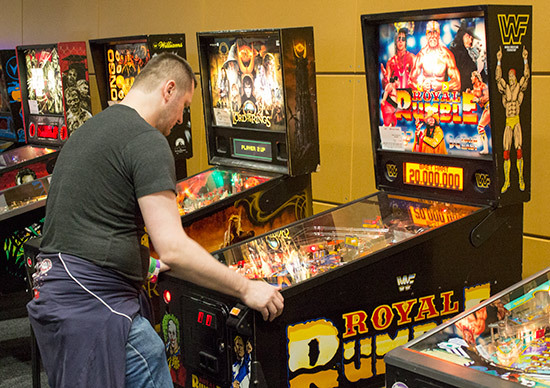 The machines chosen were the same as the A Division of the Match Play Tournament – WWF Royal Rumble, World Cup Soccer and NBA – with the addition of Stargate. Alexa won the first game on WWF and continued her success on both World Cup Soccer and NBA to give her an unassailable lead. 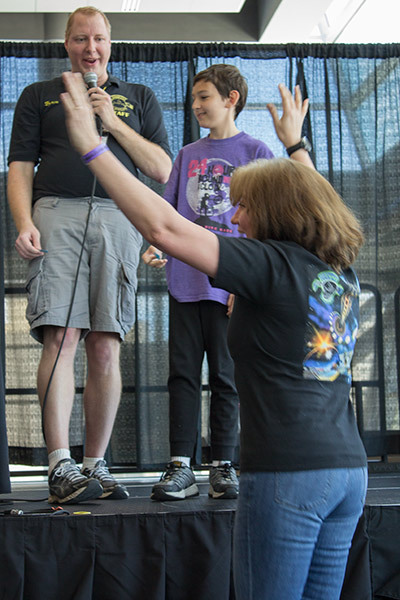 Maureen was third on the first three but won on Stargate to take second place. Sara and Julie both had two second places and two fourth places but it was Sara who took third place overall with Julie fourth. 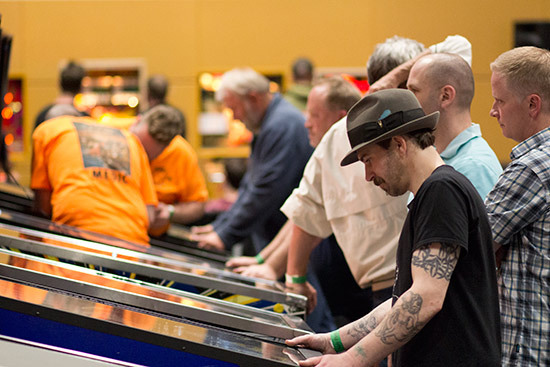 The Pingolf Tournament play-offs were contested by the top 27 qualifiers who played in nine groups of three in a three-strikes format where the player or players reaching the target with the fewest balls win, and the other player(s) receive a strike. 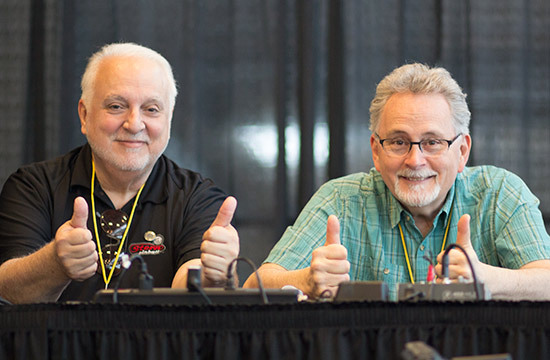 It took eight rounds before the final two were revealed as Lou Nemphos and Robert Gagno. Robert had two strikes from loses on Capt. Fantastic and Volley, while Lou had one from Joker Poker. 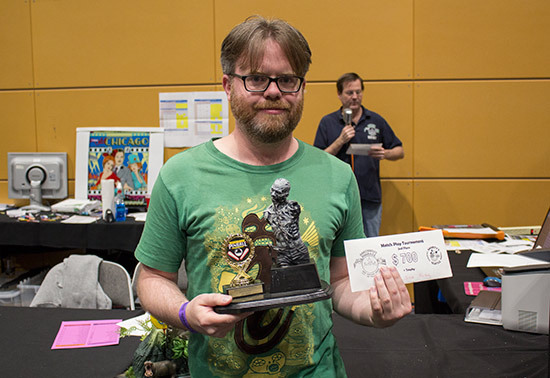 However, in round nine Robert won on Mata Hari to level the number of strikes, and repeated the feat on Vulcan to win the Pingolf Tournament. Zoe Vrabel was third, with Joshua Bartlett and Thomas Urban tied for fourth. 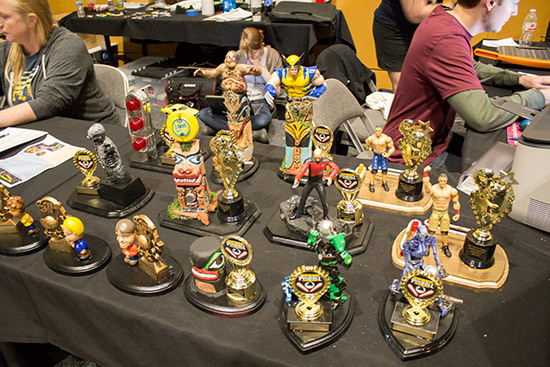 You can see all the results from the tournaments as well as a break-down of the individual rounds on the NWPAS tournaments website. 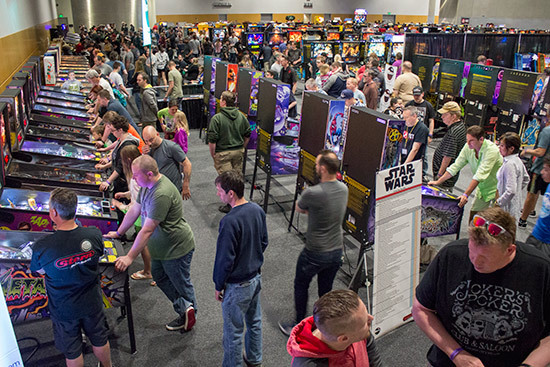 Although the show continues until 3pm on Sunday, around 1pm the official end-of-show ceremony is held in the seminars area out in the lobby. 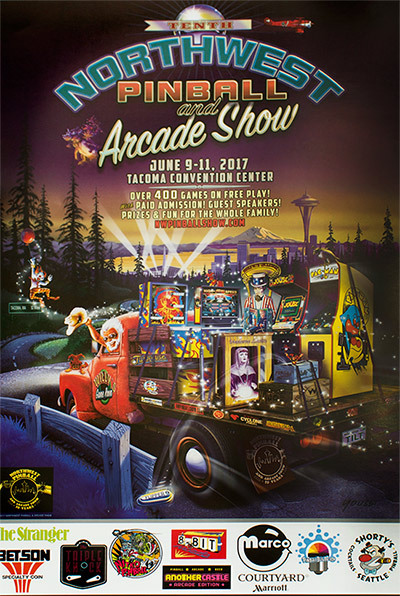 It is presented by President of the board of the Northwest Pinball and Arcade Show, Byron Raynes. 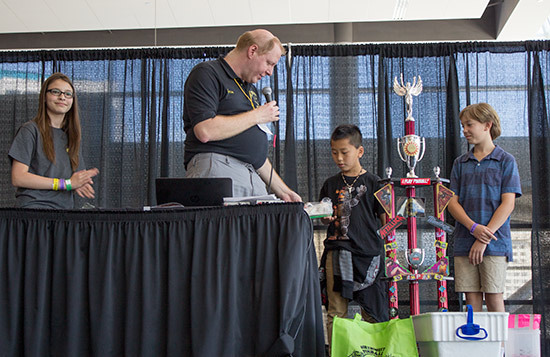 Events began with the presentation of prizes and the main trophy to the top players in the Kids Tournament which was held on the Shrek machine. 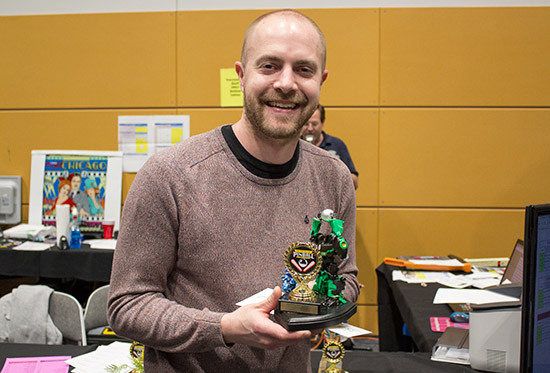 In third place was JJ who was third in 2016 as well. 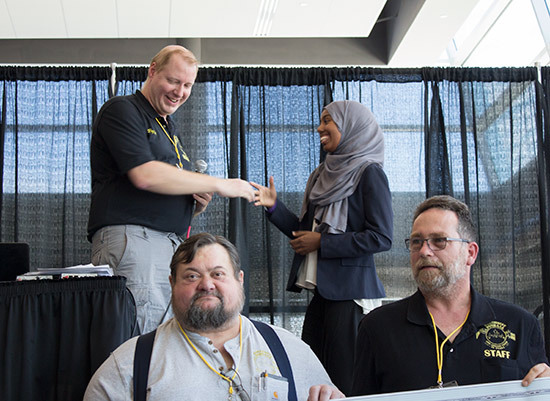 Second place went to Katarina who wasn’t at the presentation, while the winner was Jack. 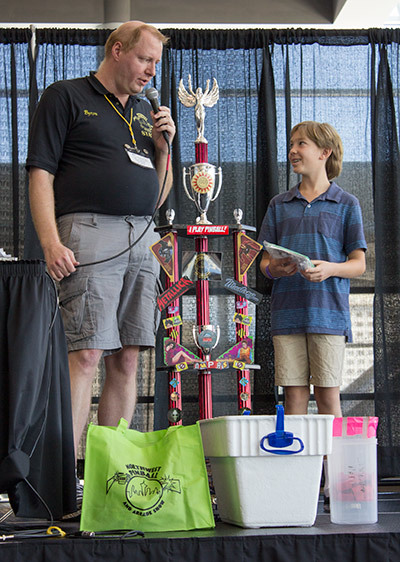 All three won some cool prizes including solar-powered robot kits. 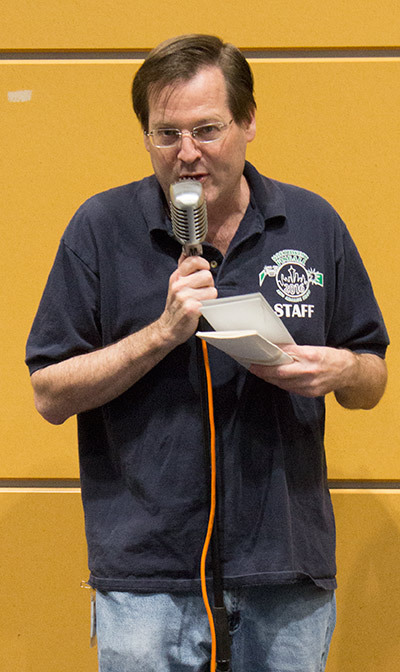 Next came the announcements of monetary awards to good causes supported by the show. To help with this, Byron was joined by other members of the NWPAS board. 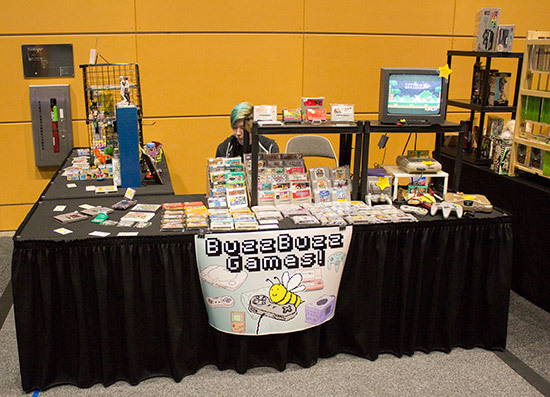 The NWPAS is a nonprofit, so all proceeds go to good causes. 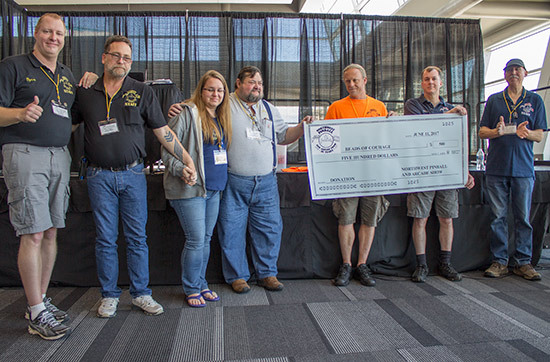 The first of these is the Make-A-Wish Foundation, to which the money raised from the silent raffle of a Ghostbusters playfield and other merchandise sales was donated. 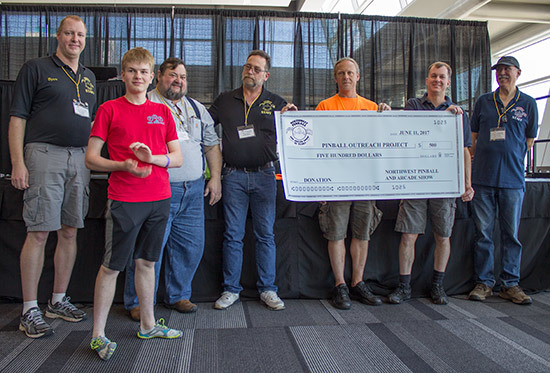 Then a cheque for $500 was presented to the Pinball Outreach Project to aid their work teaching children the history and excitement of pinball by bringing pinball machines to children’s hospitals as well as setting up summer camps and creating their own family-friendly arcade in Portland. 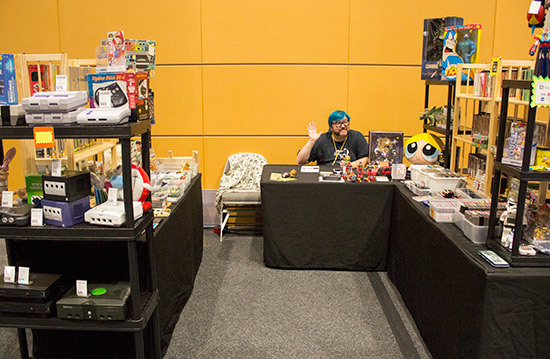 The next donation went to the Beads of Courage organisation. This is a programme where children with serious illnesses can mark milestones in their treatment and recovery through the collecting of special beads. 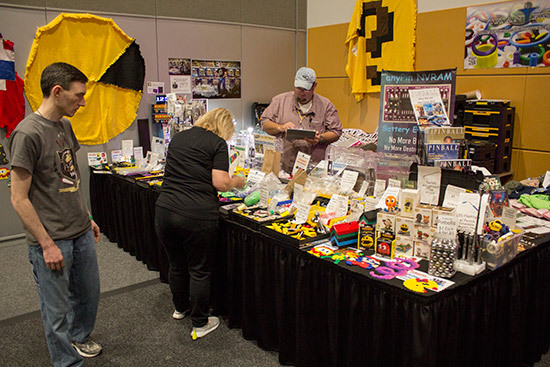 There are numerous different types of beads and collecting them not only shows the many stages each child has undergone, but gives them goals and provides a way for others to give them support. 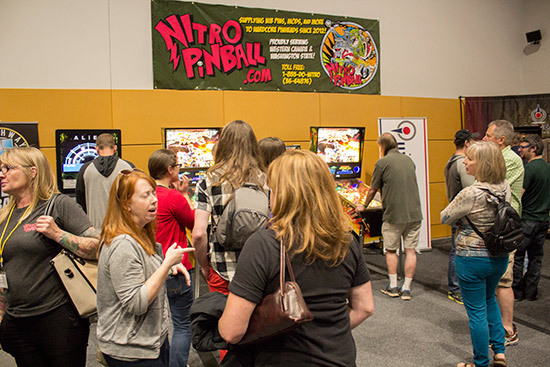 The final presentation was the NWPAS scholarship award which goes to support the further education of a selected individual in their pinball or gaming-related studies. 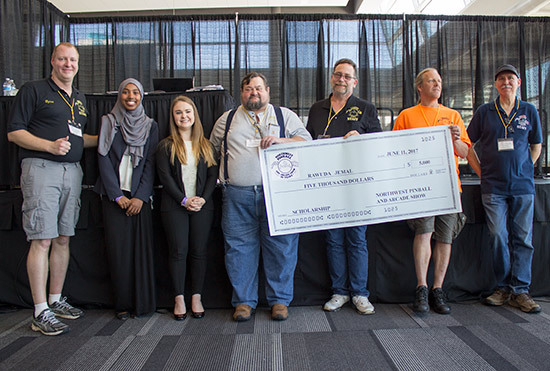 This year’s winner of the $5,000 scholarship was Rawuda Jemal. 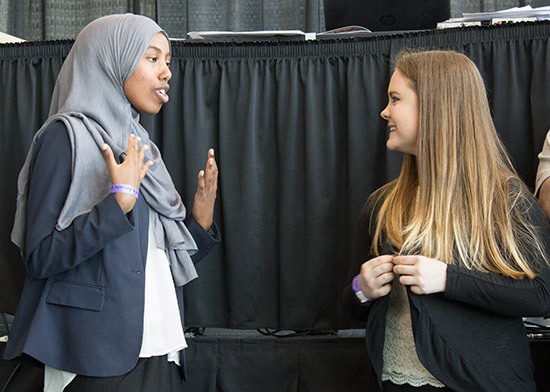 Rawuda was joined by Michella who was an earlier recipient of the scholarship and who spoke about how the money was used to help in her studies through college. 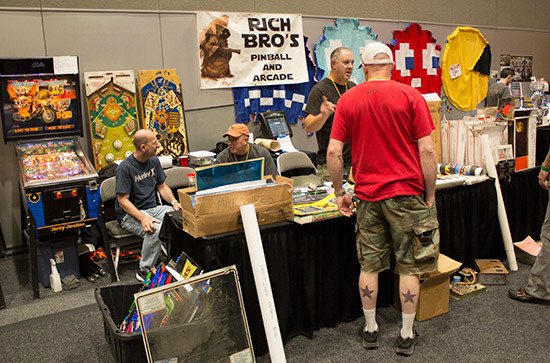 Finally, the draws took place for the Sunday raffle prize of the Mario Bros. arcade cabinet, and the grand prize raffle for the Batman 66 pinball. 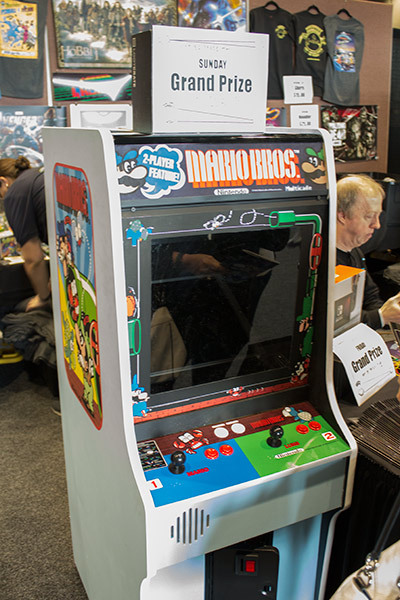 The Mario Bros. game was drawn first. 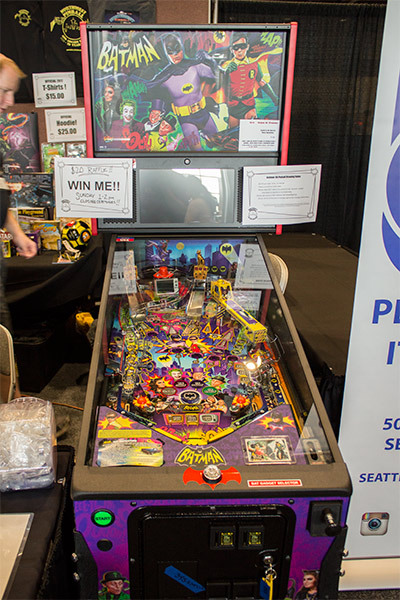 Then the draw for the Batman 66 Premium pinball was made. 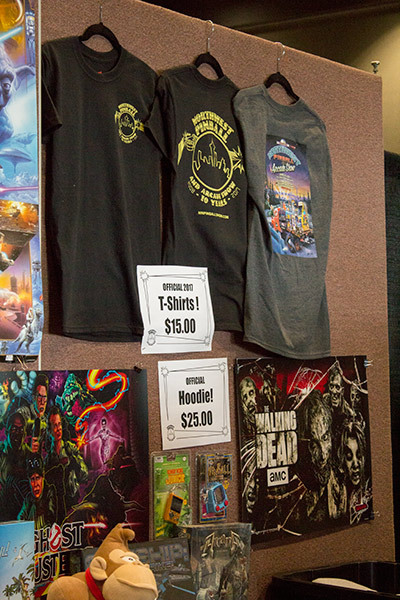 This raffle ran through the three days of the show with tickets costing $20 each. 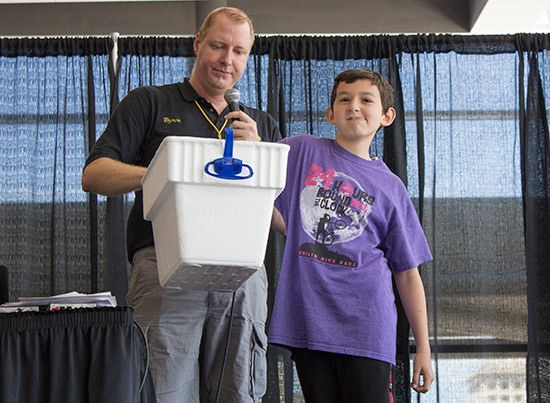 The winner was show volunteer Richard Godwin who thanked the drawer of his ticket. 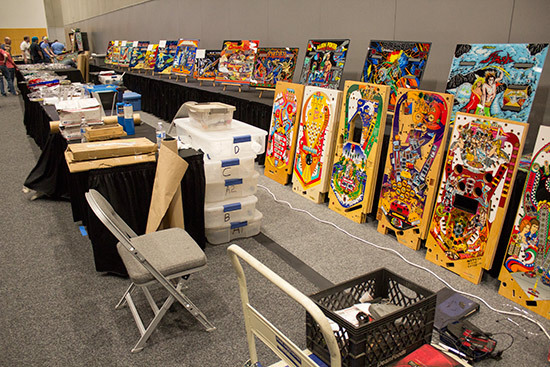 And with that we bring our coverage from the Northwest Pinball & Arcade Show 2017 to a close. 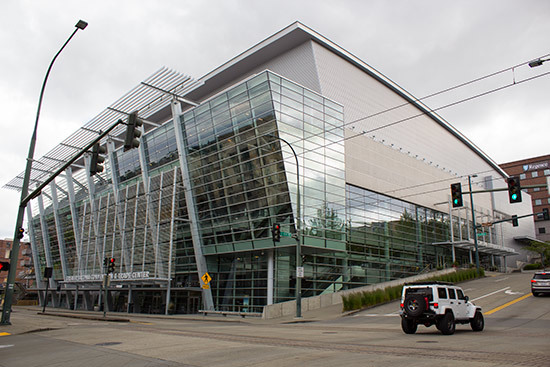 We hope you enjoyed it as much as we enjoyed being there and reporting on the events in Tacoma. 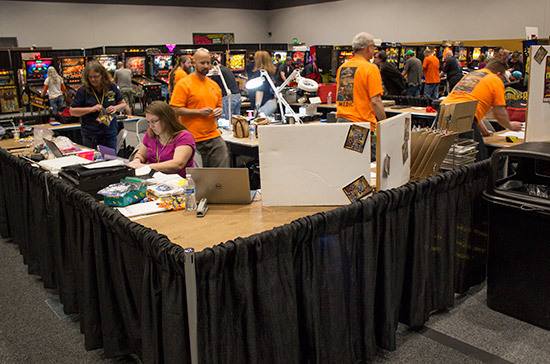 There’s a huge team of volunteers who make the show happen, from the early planning stages, through to the unloading crews, the medics, the registration, raffle and information desk staff, the seminar crew and the tournaments team. 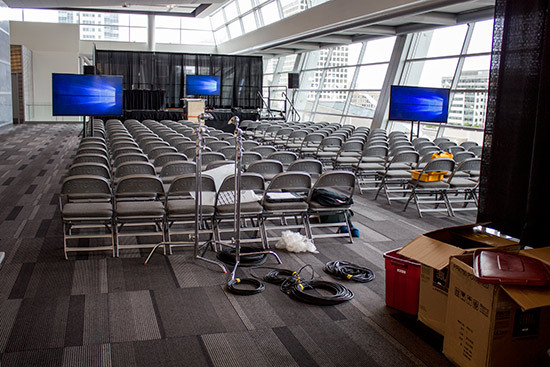 That’s before we get to the machine bringers, parts and machine vendors, the seminar speakers and the sponsors. 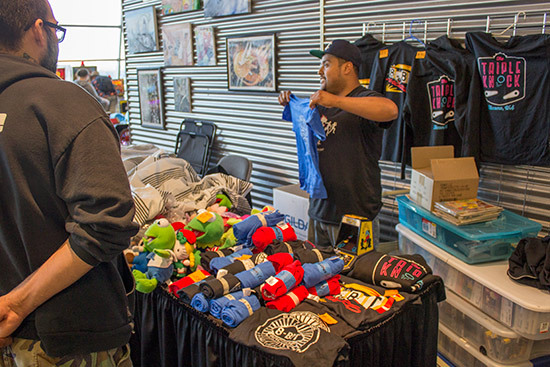 The nonprofit nature of the show, and the fact it supports a number of worthy causes adds a extra feel-good factor to events. 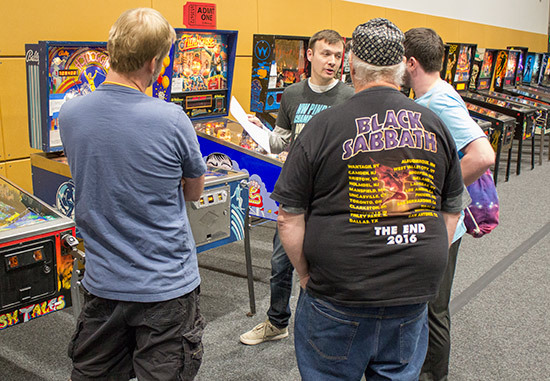 The NWPAS is now firmly established as one of the big shows in the pinball calendar, with a great selection of machines and seminar speakers while winning and keeping the support of the many pinball businesses, collectors and fans in the Pacific northwest. This was the tenth NWPAS. We’ll already making plans to be at number eleven.